In articles about magnesium, attempts to describe how important it is for health often reflect a few familiar paths. For instance, many articles will have text making statements along the lines of “over 300 different physiologies depend on magnesium”, to give a flavor of importance. We have used exactly such jargon in our writing more than once. While these statements are certainly true, they somehow seem to fall short in descriptive power. Explaining the benefit of supplemental magnesium is challenging. Magnesium enables so many essential processes in our physiology; it can’t be well described in any single forum. We feel this is particularly the case when considering the profound change it has had on our health and that of so many we know. For these and other reasons, we intend to dig a little deeper into one of the most fundamental mechanisms causing magnesium to have such a broad impact on health. To do this, we will look at how magnesium enables and underpins cellular energy usage and cellular metabolite transport. These are two of the most fundamental and widespread of magnesium’s many roles, and each is important to the entire envelope of our body’s function. On top of many lists touting health benefits provided by magnesium, we often find descriptions claiming that magnesium helps deliver cellular energy. The energy gain phenomenon is so real and so powerful, to better describe it, we will now use a simple yet detailed chemical and mechanical model as a further means of framing the importance of magnesium status. By using this simple model we can look more closely at what “energy” really means to our body and how magnesium actuates it. We hope this article might help some to understand better a few of the most important roles magnesium plays at the foundation of our cellular biochemistry. 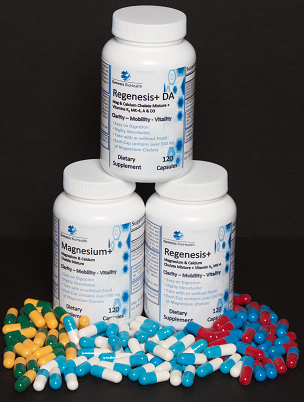 Please check out our premium collection of magnesium and other metabolic support complexes at Genesis BioHealth. Our products deliver therapeutic dosages of both magnesium and vitamin K2-MK4 in a convenient and flexible way as needs change over time. We use no fillers of any sort, and our products help the body replenish and maintain a few critical things needed to maximize potential. Our individual products make up a unique multi-part system of essential supplements that work together to support cellular function at the heart of metabolic and immune regulation. While these critical nutrients and minerals are known to operate together in multiple ways to achieve their impact, at the same time they have become difficult to get in a modern process food diet. For such reasons, lack of these vital nutrients affects the health of a vast number of unknowing people. The chemical processes keeping us alive are very complex. In this article, rather than dive into technical jargon and details, we will instead try and draw broader analogies from easy to comprehend examples. Then to support the developed concepts with a video for visualization. First, though, we should realize that our body has to accomplish many billions of mechanical tasks each millisecond to continue its existence. With all these ongoing tasks to be potentially performed all the time, practical logistical concerns for raw material needs have a profound impact on our body’s ability to do things like breath, walk, think, talk, move, sleep, heal, defend, grow, digest, etc. In each of these biological processes, complex interactions must occur between multiple systems of our body. Each of these bodily systems is subsequently composed of multiple types of individual cells each having their own needs, magnesium being high on the list of shared resources, and simultaneously one of the hardest to get from diet alone. Each of our movements, thoughts, or nerve impulses has a cost in terms of time, energy and a continued flow of chemical resources. Virtually every function in our body has these same physical limitations. A giant commonality of life is that for each cellular process accomplished, numerous resources must move back and forth across cellular membranes. 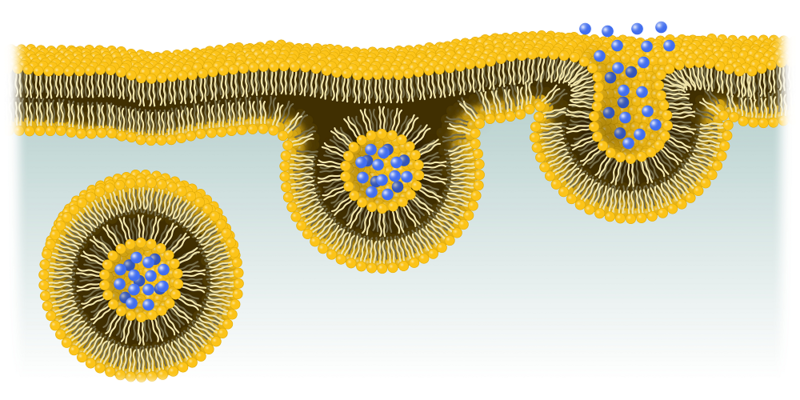 The figure below shows a cartoon-like graphic of a cell membrane. All the colored blobs floating in the membrane are biological “machines”, each participating in specific life-critical functions. The makings for these molecular machines are coded for and controlled by our DNA and manufactured inside our cellular spaces. Either switches, triggers, ports or gates, when you get right down to it. All of these molecular machines need magnesium to be built, transported, operated and maintained. The eyes, ears, mouths and limbs of the cell, yet coming in the vast diversity of all nature’s most amazing wonders. Many, or even most, of the material selectively allowed to “move” through the “walls” and “compartments” of a cell require a net input of mechanical and/or chemical energy. The majority of these specialized “channels” into the cells inner compartments have a gate-keeping function so that only certain things are allowed to pass selectively. The body accomplishes these complex microscopic mechanical tasks using an amazing ability to create seemingly unlimited arrays of very specific biochemical machines made from protein. We will take a closer look at the workings of one such gate-keeping channel below. Technically the channels going through the cell membranes are a class of compounds called “transmembrane proteins.” These large chemical structures are manufactured inside the cell from many types of smaller building blocks; many also being imported through such channels. Upon completion, the transmembrane proteins are transported to, and installed in, the “membranes” to which they belong by yet other dedicated cellular transport machinery. Once installed, the transmembrane proteins typically have different functions on the outside vs. the inside of the membrane. The blueprints, the manufacturing processes, the auxiliary support structures, and the regulatory codebook for these hordes of living machines are all stored in our DNA, deep inside the arcane processes of each cell. While it may not be common to consider, each time we create a thought or action, a series of cells in our body starts manufacturing specific chemicals. After the chemicals are produced inside the involved cells, they are either used internally or often exported to interact with other cells in the body that need them. We give names to these manufactured chemical machines like hormones, neurotransmitters, metabolites, enzymes, factors, co-factors, cytokines, cell walls, ribosomes, integral membranes, and many other names. In the end, one of the most important things to realize is that our body has to manufacture all these different macro-chemical structures inside our cells using a long series of complex cellular machinery and processes. Because of the similar nature of all manufacturing processes, we can think of these miniature cellular factories as being very like a large integrated industrial complex we might see in any technological city. Every coordinated action in our body means biological factories go into action, somewhere deep inside our cells, to achieve current objectives. At least we hope they do! If they have enough magnesium, that is! To manufacture anything, anywhere, be it in our cellular factories or a large industrial city factory, raw materials, their movement, their transformation, and energy are always required. For cells in our body, this means we have to move many varied resources from outside the cell, to the inside and vice-versa, all while excluding unwanted toxins or anti-nutrients. Once pumped inside a call, metabolites might get further tagged, routed and transported to other specific regions of the cell to fulfill their destinies. The orchestra of chemistry and its organizational complexity is nearly magical, especially since it has arisen amidst the surrounding chaos reigning at the microscopic thermophysical level. After all the required building materials arrive at their final destinations, they go through a set of complex processes very much like an assembly line. The cellular manufacturing process starts with reading the DNA to get the required design template and ends with a newly folded protein or alternative piece of cellular machinery ready for shipping out to its final destination. The finished products of these intracellular factories must then be exported from the cell so they can be used and/or imported in turn by other cells. The process of exporting finished chemical products from inside a cell is called “secretion.” Whenever we think or act, lots of cells have to secrete things and also to digest things like neurotransmitters, hormones, or other chemical species, which then interact with other interconnected processes in various ways. 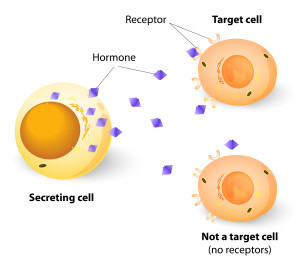 The figure above shows a typical example of one cell secreting a hormone to be read by another cell’s receptors. In this way, factories in different regions can coordinate their actions to achieve larger, multi-system tasks such as turning over bone cells and scavenging calcium from soft tissues. Effective nutrient driven logistics and their regulatory biochemistry must function smoothly to keep the factories of our blood and immune chemistry functioning properly to better stem the tide of aging. The cellular receptors shown here are another type of transmembrane structure embedded in cell walls and involved in cellular communications. All the manufacturing and secretion of finished products described above requires lots of “energy.” Commonly we are taught to think of energy from food as “calories.” Well, this isn’t very true in the end. On its own, a “calorie” is only a little measure of potential or existing heat. Heat by itself can’t do anything except flow to regions of less heat. To get work out of a process, we must couple the heat flow to mechanical machinery. It is just the same with molecules at the cellular level as it is for a machine in an assembly line of a factory. One of the most common forms of chemical energy our body uses to derive practical work is called “ATP,” or Adenosine Triphosphate. This little molecule, called a nucleotide, gets manufactured and destroyed over and over again in our bodies. Its job is to both carry and supply energy where it is needed. It is used as a vehicle to spread fuel around wherever it needs to go. When ATP gets where it is needed, it ultimately gets metaphorically burned for work, or at least a part of it does. Just like a gasoline distribution system, starting in a refinery and ending in our cars engines, our body makes lots of ATP in specific locations and allows it to spread through our body to get used. Most ATP is used quickly, however, so it usually doesn’t spread too far. Here is where magnesium finally comes in. For ATP to deliver energy and achieve work, it must join to magnesium. Meaning these two chemical species must bind together to form a single unit, called a complex. This complex has a very special shape and electrostatic charge pattern allowing it to fit tightly into special activation pockets wherever it is to be used like a key into the keyhole of a lock. An ATP molecule, by itself without magnesium, can’t be used to create any work because it won’t have the correct shape or charge distribution. If a person is low in magnesium, their body will spend excess resources and energy making ATP which will then just float around uselessly until it meets a lonely magnesium ion. On the other hand, if we have more free magnesium in our cells, we can use ATP more quickly because the ions are more plentiful and the ATP can easily find a magnesium when it is needed. Having more energy and using it more efficiently means we can accomplish more tasks in the same time frame. Being able to spend more energy units in the same time frame allows our body to multi-task more effectively. Providing our body with a better ability to chemically multitask can have many significant and practical impacts on life and health. As an example, enough magnesium might better allow us to take care of our family, fuel our immune systems, flush stress hormones, deal with adversity, and function more effectively without tiredness, all at the same time. Who cut the energy budget? Imagine if we were to try and run a large industrial complex without enough fuel? Would we get out as much product over the same time frame? As much productivity? Of special importance to many readers on the downhill side of gray, what about our factories maintenance budget? The answer is no. We simply can’t make as much product in our factory or keep it maintained properly without as much energy and resources. It is precisely the same in our body. We don’t want to get into a state where magnesium status (or any other micronutrient status) is limiting the rate of our metabolism and its ideal chemical production and distribution output. Such a state of magnesium shortage will always lead to rationing, and will necessarily result in the down-regulation of important cellular activities affecting long-term health. In the section below, we will use an animated video to show biochemically one way magnesium and ATP contribute to cellular workflow and provide energy for ongoing mechanical processes. We hope you enjoy it and learn something new! As an example, we will consider a broad reaching aspect of the cellular lifecycle called “primary active transport.” Primary active transport is a set of different cellular pumping mechanisms for different materials. It is these type mechanical processes where various metabolites are pumped into, or out of, cellular compartments against their natural tendencies of random diffusion. Whether pumping water uphill or filling a vacuole with magnesium ions, both pumping activities require energy and mechanics to move material against the fundamental forces of nature. From the secretion of bile to the absorption of a fat droplet to its delivery to the liver to its absorption into a set of liver cells, or for any and all of the involved cellular processes of the body, active transport is essential. We can’t think of a more fundamental level of function for defining the key mechanisms of life and health, other than the genomic activities themselves. Start the pumps! We’re taking on water! With the description above in-hand, we ask the reader to think of primary active transport as our “cellular pumps.” Cells have to pump all sorts of stuff all the time. Any thought or action requires all kinds of cells to pump many things in and out across many cellular compartments. As such, our “pumps” are very-very important for all aspects of health and life. We should try to do everything possible to keep our pumps running at full speed all the time. Magnesium is a huge help here. Higher levels of magnesium allow our body to pump more efficiently by enabling faster ATP turnover. Faster ATP turnover means that we can produce more thoughts and actions in less time. Ask any boat captain about the impact of pumps on life and death at sea? Simply put, if a ship can pump out water as fast or faster than it is taking it in, it will continue to float on, even with a hole. If the old pumps slow down beyond a critical amount, it’s never good, and the boat will begin to take on water! The type of active transport we illustrate below is called “Ligand-Gated” transport. We will focus on a particular subset of this transport class that specifically uses a piece of toolkit called an “ATP Binding Cassette” (ABC transport). ABC transport is a fascinating and important type of cellular transport, but there are many others types. All forms of active transport require magnesium and ATP either directly or indirectly to provide motive force, the true nature of cellular energy. We have chosen to illustrate ligand-gated ABC transport because it is also important for understanding why vitamin K2-MK4 is important for many forms of cellular communications. Later we might decide to cover how MK4 can “activate” many ligands in the body, in effect turning them on, or off. That is a story for another article, however. Back on the magnesium front, we can think of active transport machinery as important pumps responsible for getting nutrients across membranes so we can achieve necessary and desired tasks and actions. If we can’t move material across membranes fast enough, we don’t complete critical tasks and procedures at the desired rate. Thus our cellular punch list might start to fall behind, leading to worse health outcomes. Ion transport – pH, Calcium, Magnesium, Potassium, Sodium, etc. Chemical signaling – cellular receptors, neurotransmitters, blood brain barrier, bile, liver, pancreas, skeleton. Drug uptake and Toxin removal – identification, import, and export of many non-specific sorts of compounds. We hope you enjoy the animation and it helps you understand how cellular magnesium concentrations directly control the rates of many important biochemical processes. Please get your magnesium at our store here. Without magnesium, cellular logistics will grind to a halt. If the body is only 10% low, then 10% of potential interactions don’t happen. Nutrient shortages force the body to ration, or timeshare, its most precious resources. Forced rationing of vital energy resources slow the metabolism and all dependent processes, like our health! Slowing our health is never good, Get your Mag Today! While it may be a surprise, over 60% of Americans have one. Some studies show that the number of people affected by this disorder may be as high as 85%. Possibly more importantly, this estimate is based on the standard Recommended Daily Allowance (RDA), which is 400 mg of elemental magnesium for an adult male and 320 mg/day for an adult woman. Modern research, widespread practice by magnesium users, and studies of primitive cultural diets, indicate that the human body can continue to improve its function at dosages up to at least twice this amount. Common typewriter leg syndrome, a seemingly automatic initiation of nervous leg tapping, is an easily spotted indicator of deficiency in many people, but might require a large dose for a long time to affect. Such behavior can be widely observed in any public location and is often thought to be “normal” by those affected. While most don’t know it, this typical behavior is usually caused by a relatively large magnesium deficiency. If neurons of the leg muscles are not able to fire normally, then other unobserved symptoms will also be present. To further confuse the situation, blood testing is not an accurate indicator of cellular magnesium status. Because of that, the following simple guide is often a better way to determine if one might benefit from a magnesium supplement. If the answer for you is yes, then we hope you will consider Genesis BioHealth for your magnesium needs. Our specialty is a potent and pure blend of magnesium complexes formulated to improve metabolic function over and above standard magnesium formulations. The formula provides extra value in each capsule. In addition to magnesium, our blend contains three beneficial amino acids and metabolites known to help metabolic energy output and nervous system stability, as well as Vitamin C. Because we value purity, we use no fillers or other excipients of any sort, except for the capsule. Here are some questions to think about that might show behavior patterns known to accelerate a person’s potential for magnesium deficiency. Dark colored sodas contain phosphate which binds to magnesium and renders it useless to the body. Even eating a magnesium rich diet will be fruitless if a person drinks much dark soda. Refined sugar causes the body to flush magnesium through the kidneys. Do you consume products containing caffeine daily? Caffeine accelerates the rate at which kidneys release magnesium. Alcohol has a similar effect on magnesium levels as do diuretics. Alcohol, therefore, also increases the rate at which kidneys release magnesium. Some medications adversely impact magnesium absorption. Are you currently taking a calcium supplement? When a person is deficient in magnesium, calcium can interfere with magnesium absorption resulting in loose stools. Calcium is also much easier to get in a normal diet due to its prevalence relative to that of magnesium. Finally, the body needs much more calcium than it does magnesium. Factoring in these relative impacts, many believe it is best to take supplements with less than a 1:1 calcium to magnesium ratio. In ratios where magnesium is greater than calcium, magnesium is able to stabilize the solubility of calcium, making it more soluble in serum and plasma. If one is already magnesium deficient and/or has a compromised calcium physiology due to multiple fat soluble nutrient gaps, taking calcium supplements with more than a 1:1 calcium to magnesium ratio can cause arterial, or soft tissue, calcification. Many people past 40 have excess calcium that has settled in soft tissue and is contributing to inflammatory loading for just this reason. Magnesium alone can help reduce this, however, in combination with vitamins K2-MK4, other fat-soluble nutrients and basic minerals, the rate at which calcium in soft tissues is shuttled to the skeleton, can be increased even further, helping the bodies natural chelation processes put calcium into its proper places. One such product is “Magnesium+” from Genesis BioHealth. 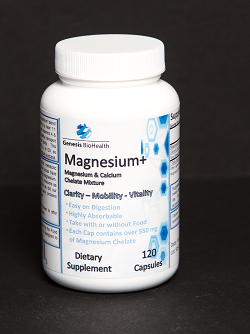 Magnesium+ has an ideal ratio of calcium to magnesium, coming in at just under 1:1. Modern research also shows that taking magnesium along with vitamins K2-MK4, A and D can further synergize the absorption and impact of the magnesium itself. 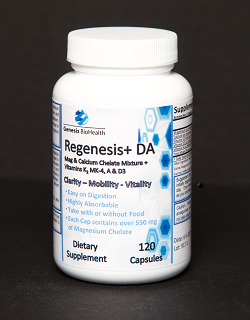 Genesis BioHealth also offers such a product in our “Regenesis+ DA” formula. This synergistic blend of critical nutrients is known to help stabilize calcium metabolism as a whole, and can even strongly contribute to the reversal of many other metabolic conditions, such as Diabetes, Heart Disease, and Osteoporosis. For those that don’t want to supplement calcium, we also offer non-calcium versions of our products such as “Magnesium” and “Regenesis“. Adults 55 or older are at much higher risk for magnesium deficiency. Reduced levels of gastric acid due to aging also hinder the absorption of minerals. What to do about a suspected magnesium deficiency? Less than ideal amounts of cellular magnesium impede its effective coordination and distribution within the body’s various tissue compartments. Over time, chronic rationing of magnesium and other critical micro-nutrients within the body drives faster than normal aging and potentially contributes to the onset of many age-related, non-communicable diseases, such as diabetes, heart disease, osteoporosis, arthritis, thyroid, allergies, and psoriasis. The elimination of this complex magnesium rationing process in a deficient person can be a major driver for the return of overall health and vitality in many cases. These and many other auto-immune driven disorders can be improved if all the necessary co-factors are present and accounted for. Our bodies have a survival ability that allows them to enter a sort of “selective micro-starvation” mode. In this state, the body can begin to cannibalize itself to supply critical resources for more important processes, from single nutrients, all the way to full starvation, our bodies can adapt the physiology to maximize survival odds. There are many examples of such in the body. Cellular lifecycle management includes the rationing process which is important in times of shortage. The logistical control systems of animal physiology allow multiple processes to be managed simultaneously even in times of shortage. This flexibility allows many concurrent life critical biochemical pathways to proceed continuously. Resources are procured and shared to support ongoing organ function, soft tissue repair, immune function, and all the regulatory physiologies that control them on a second-to-second basis. In fact, over 300 different physiological pathways depend critically on magnesium being present in each included cell. If there isn’t enough nutrient for all processes to run at full speed, some are forced to slow down dramatically, or even can be turned off genetically. All so that other processes may proceed at more effective rates. The best way to ensure that all systems in the body have the best chance to multi-task at full speed is to keep nutrient levels high, especially magnesium, as it lies at the foundation of chemical energy production and cellular communications. If a person chooses to use magnesium supplements to improve symptoms they believe might be related to magnesium status, then they should be prepared to be patient and diligent. This is necessary to give time for the cells to replenish their stores so that the magnesium can begin to work. Our body’s magnesium tanks are quite large, metaphorically, compared to the rate at which we can take it in. Furthermore, persons who begin with a magnesium absorption challenge may first have to deal with loose stools for several months before the GI tract can adapt, and begin to absorb the nutrient without distress. Patience and diligence here will reward the practitioner, as this situation actually indicates a large deficiency of magnesium. Because of this, while it can be as little as several weeks for some people to detect the benefits, for others it can take several months of challenging GI adaptation to reach more than 1x the standard RDA and really begin to get ahead at filling the metaphorical tank. Often for those that are very deficient, then it will take a fair time to significantly impact cellular magnesium status and thus begin to reduce deficiency related symptoms. Failure to take enough quality magnesium at levels over the daily requirement for a sufficiently long term is a common cause of people not benefiting from supplementation. Often, the first symptoms people notice when beginning magnesium supplements are a mild increase in “energy” throughout their day, cessation of muscle hypertension, hyperactivity, or potentially even lucid dreaming. Our customers report all of these benefits and much more! Finally, we suggest to never buy a magnesium supplement containing “magnesium oxide”. This form of inorganic magnesium is less than 4% bio-available in a person with a healthy gut. Given the above, we will now move to practical measures one can take to increase cellular magnesium levels in the body, and maintain them over time. If you answered “no” to all of the questions above, then just eating a diet high in magnesium might be adequate for you. If you answered “yes,” however, to one or more of the questions above, then utilizing the strategies below, may help to improve your health. Supplement with a quality form of organic magnesium – Make sure the label clearly indicates how many milligrams of “elemental” magnesium is in the serving. Many vendors list the magnesium content as milligrams of whole magnesium complex instead of only the elemental magnesium it contains. These are not the same values. This practice often confuses buyers and leads to dramatic under-dosing at a higher cost. Organic forms of magnesium complex need to be consumed in relatively large quantities to get the full benefit. Just because a new user starts to feel a benefit from an inferior capsule, does not mean that this is all the benefit they might get. Enough magnesium needs to be consumed and stored in cells to fuel the rate of all physiologies, not just a few. As the body begins to utilize magnesium more effectively and upregulates dormant or stagnant processes, dosage requirements can actually increase over time. When using an organic form of magnesium, it should require the user to intake an entire gram or more of supplement to gain just 100 mg of elemental magnesium, a 1/10th yield or so. The same applies to other organic forms of magnesium. In each case, the yield ratio will depend on the amino acid or another organic metabolite used to complex the magnesium. Other common types of amino acids used to deliver magnesium are taurine, lysine, threonine, etc. Citric Acid is another commonly used metabolite used to provide magnesium. Each has specific attributes. A less commonly used magnesium complex is “magnesium ascorbate.” “Ascorbate” comes from “ascorbic acid,” which is vitamin C, a powerful antioxidant, and essential regulatory co-factor. Taking magnesium ascorbate is an ideal way to consume both vitamin C and magnesium at the same time. This is a bonus for vitamin C impact as well because magnesium is critical in the physiology of vitamin C. Taking both nutrients as a single complex prevents the need for the body to use existing stores of potentially depleted magnesium when using C biochemically. Because of these factors, Genesis BioHealth’s unique formula also packs several added benefits beyond that of a single-component formulation. One other thing that can help a person get their full lot of bioavailable magnesium with less GI impact is to make sure to use a fully reacted form. I won’t go into long explanations of magnesium’s natural side-effect of loosening the stool when it isn’t absorbing well. 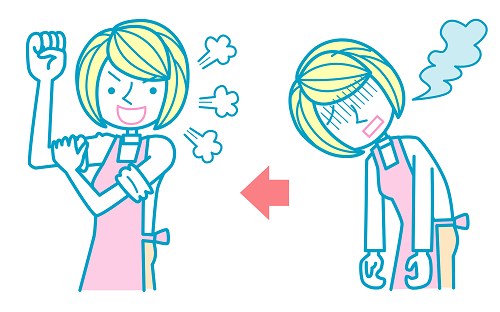 This side-effect is common in new users and must often be worked through over a period of months. However, part of the side effect is caused by the fact that organic forms of magnesium are mildly alkaline. These products are mildly alkaline because they result from the reaction of a strong base and a weak acid. To explain this concept, we will use glycine as an example, which is an organic acid. If a chemist reacts magnesium hydroxide, which is a strong inorganic base (pickling lime), with glycine (an amino acid) to the greatest degree possible, they will obtain “Magnesium Bisglycinate.” This complex is the fully reacted salt of a strong base and weak acid and thus will be alkaline. Here “Bis” means possessing “two” glycines. The more alkaline a material, the more potentially distressing it is to the GI tract, and the more difficult it will be to absorb and consume more stomach acid to do so. Chemically, magnesium must bind two negatively charged species to be stable. In this case, if enough glycine is present, each magnesium can bind two glycines. In such a fully reacted magnesium complex, the weight of the elemental magnesium is approximately 1/10 of the total weight of the entire complex, while the two glycines make up the other portion of the weight of powder in the capsule. Moreover, in a fully reacted supplement, the alkalinity has been minimized because the more alkaline hydroxide is completely reacted away. The starting material, magnesium hydroxide is strong enough to induce chemical burns onto the esophagus; whereas, the fully reacted bisglycinate is right where the body expects it. Foods primarily contain magnesium in such organic forms. Both plants and animals store the mineral in their cellular structures bound to various organic compounds, including all of the types discussed. These forms then make absorption easy and natural for the GI tract if it is healthy. At Genesis BioHealth, we use only the “bisglycinate” form of magnesium. This complex has one magnesium and two glycines. We like this as opposed to the more common “glycinate” form. This is because the magnesium glycinate naming convention does not specify how many glycines are complexed to each magnesium. Bisglycinate, on the other hand, is a formal name and indicates a fully reacted complex. This naming convention ensures that each magnesium has two molecules of glycine as it should be. This is important because ambiguous naming, from an FDA regulatory standpoint, can result in obtaining an underreacted or impure mixture of magnesium. If a batch is either under reacted, or labeled ambiguously, then it is likely to contain residual starting material or worse. A slightly underreacted batch is less expensive to manufacture and consumes less glycine. It will also, not coincidentally, yield more magnesium per gram which is another economic benefit for the seller. The unreacted portion that is potentially left over is called magnesium hydroxide. This material actually has a higher magnesium density than the desirable end-product, and will mathematically deliver more magnesium per gram. Unfortunately, hydroxide ion will also inflict damage on the lining of the GI tract and consume excess stomach acid to dissolve. In extreme cases, powders sold under these chemically ambiguous naming conventions can also represent a mixture blended with magnesium oxide, these are sometimes called “buffered” varieties, but this is not required by law. In reality, magnesium oxide increases magnesium density even more than hydroxide at even lower cost. It is also effectively unabsorbable and will pass through leaving little behind but gastric irritation. Unfortunately, underreacted batches will always contain at least some left over hydroxide and give some irritation to the GI tract. While this may not seem that bad, it is really just another cellular damage / inflammatory load that the body must repair amidst conflicting priorities. In the end, such materials reduce potential health impact and capsule value. Analytically, such mixtures are often indistinguishable from the product they are named after in the lab. Performing additional rigorous testing is the only way to distinguish a real quality powder from a shoddy blended one. Because such rigorous testing is seldom performed, these type products abound in the marketplace. To ensure a quality product which does not adversely impact the lining of the GI tract, a slightly over-reacted mixture is desired, which will have no hydroxide, no oxide, and a slight excess of amino acid. We only sell such fully reacted pure materials at Genesis BioHealth, so this is never an issue with our product line. Eat fewer grains, nuts, seeds and oils – Foods derived from the seeds of plants, which includes these foods, have several problems regarding their impact on the body’s magnesium status. Firstly, these foods are relatively low in magnesium compared to other foods, so there are simply better foods to eat from a magnesium perspective. Secondly, these foods all actively bind magnesium and prevent us from absorbing it. Some foods can potentially strip it from our body faster than it is put in. Even worse, than simply affecting magnesium absorption is a more insidious problem. There are aggressive biological metabolites present in all seeds which can actively interfere with the use of magnesium in our body. These compounds are present in all seeds because of their need to prevent insects and animals from eating them, as well as to allow them to be dormant for long periods. are called “anti-nutrients”. These foods may taste great, but they don’t have much of what our body needs. To top it off, other bad chemicals in seeds further make our body use magnesium less efficiently. Because the hunger response is largely driven by our body’s need for micronutrients like magnesium, nutrient poor foods are not able to adequately quench the appetite. So aside from too many calories, these foods can also make us hungrier. This situation contributes heavily to weight gain while at the same time depriving us of vital nutrients. Part of the reason seed based foods have these properties is due to their particular biochemistry. Seeds are meant to pass through our body or to lie dormant for up to hundreds of years. This is to ensure their survival and ability to germinate when water, sun, and soil are available. The types of edible seeds we discuss are real survival foods, but not nutritious for support of the holistic regulatory / repair / immune system, and thus long-term health. If we have a choice, we should minimize these foods or remove them from our menu. Eat less refined sugar, high fructose corn syrup, and alcohol – These foods all increase the rate of magnesium depletion, induce a heavy cellular repair load on the body, and have many other adverse effects regarding magnesium. In short the less you eat of these foods, the easier it is to keep magnesium levels in the target range. Drinking less coffee, soda and carbonated beverages – These sorts of drinks contain both phosphoric acid and caffeine. Each of these chemicals put negative pressure on magnesium status. The phosphoric acid can block absorption, while the caffeine has been shown to increase the rate of magnesium removed during urination. Furthermore, these drinks often have diuretic properties which also cause accelerated usage of magnesium, which is water soluble. Up levels of magnesium-rich foods – As stated in the previous category, these are NOT foods made from any plant seeds. It doesn’t matter if the label shows the food contains the mineral or not. Just because food contains magnesium, does not mean your body can assimilate it during digestion. Instead of looking to the problematic foods mentioned above, instead, focus on quality foods that are from the meat/dairy/vegetable or fruit categories. Avocados are an excellent example. They are the poster child of magnesium rich foods. Unfortunately, the avocado today only has about 60% of the magnesium it did 100 years ago. So it is deficient too! It is not economical to replace stripped magnesium from commercial farmland, so as the decades have rolled by, the soil in which commercial cash crop foods are grown has become barren of magnesium and other critical minerals. Failure to replace magnesium in commercial farmland is one factor driving the widespread deficiency today! In short, magnesium is one of the most important minerals in the human body. Over 300 biochemical pathways depend on magnesium. In truth, this common categorization doesn’t really adequately highlight the power of magnesium and its potential for impact on many people. Without enough magnesium, multitudes of biochemical reactions do not happen at top speed, thus slowing things down and compromising such important physiologies as our immune and cellular repair systems. Having a slow immune / cellular repair system is never good for our health or energy levels. In fact, since I have adopted our protocol, using about 600 mg of magnesium/day along with the other “Six Tenets of Behavioral Health“, I have barely even had the mildest of a sore throat. Because the modern food supply does not provide adequate magnesium or K2-MK4, and further decreases the efficiency with which our body utilizes them, supplementation is a great solution for many people. We hope you choose Genesis BioHealth supplements as part of your alternative health solution.